POSTED January 31, 2019 10:26 a.m.
FENNIMORE — Friday was a special night in multiple ways for the Fennimore wrestling team. The Golden Eagles celebrated Senior Night by clinching a fifth straight Southwest Wisconsin Activities League duals title with a 40–22 victory over rival Mineral Point. Fennimore improved to 7–0 overall and finished a perfect 6–0 in SWAL duals. The Pointers fell to 11–3, 4–1. 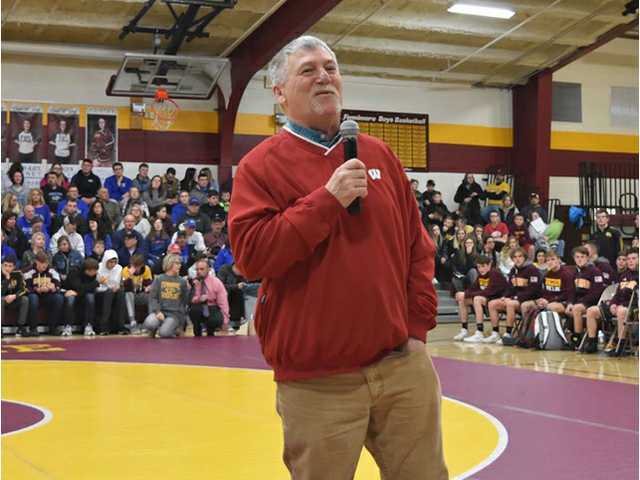 Prior to the match, the capacity crowd honored former Fennimore head coach Greg Jentz, who will be inducted into the Wisconsin chapter of the National Wrestling Hall of Fame later this year. Fennimore’s seniors Kohl Wardell, Trevor Wanek, Maguire Fitzgerald, Brayden Leffler and Dylan Kehoe were also honored prior to the match. “It was great to have a packed house, especially since it was a special night for Greg Jentz that was just inducted into the National Wrestling Hall of Fame for his 30-plus years of service to the sport of wrestling. This is a very significant recognition and Mr. Bob Miller (also a Hall of Feme member) did a great job introducing Jentz. The dual opened with Mineral Point collecting a forfeit at 106 and Ross Lindsey pulling out a 2–0 overtime victory over Fennimore varsity reserve Macoy Fitzgerald at 113. Sophomore Brody Lee recorded a third-period pin at 120 to get the Golden Eagles on the scoreboard, but Danny Pittz’s 9–1 major decision at 126 and Caden Carey’s 4–2 overtime victory over Alex Birchman at 132 gave the Pointers a 16–6 advantage. Junior Aiden Nutter made quick work of Bo Hansen at 138 for a six-point pin in 1:17, but Point’s Logan Schmiz and Nolan Springer collected back-to-back victories at 145 and 152 as Point upped its lead to 22–12. Junior Trent Helms began Fennimore’s turnaround with a 6–0 victory over Chandler Workman at 160 pounds. Senior Maguire Fitzgerald was a 7–3 winner at 170, and junior Will Ahnen’s overtime pin of Kyle Vondra gave the Eagles’ a 24–22 lead. Junior Logan Klaas scored an 18–6 major decision at 195, then senior Brayden Leffler pinned Mason Horn at 220. Junior Devin Kohrs closed out the match dual with a second-period pin of Garrett Ward in the 285-pound bout. Fennimore defeated Darlington/Black Hawk 52–30 in a SWAL dual last Thursday night to set up Friday’s first-place showdown. NEXT: The Golden Eagles (7–0, 6–0 SWAL) will travel to Richland Center Saturday for the 13-team SWC/SWAL Clash combined conference tournament. Fennimore has won four straight Clash titles. 106: Colbi Carey (MP) won by forfeit. 113: Ross Lindsey (MP) def. Macoy Fitzgerald (F) (2–0 OT). 120: Brody Lee (F) def. Trapper Nafzger (MP) (Fall 4:42). 126: Danny Pittz (MP) major dec. Mason Lull (F) (9–1). 132: Caden Carey (MP) def. Alex Birchman (F) (4–2 OT). 138: Aiden Nutter (F) def. Bo Hanson (MP) (Fall 1:17). 145: Logan Schmitz (MP) def. Trevor Wanek (F) (9–2). 152: Nolan Springer (MP) def. Nick Blaschke (F) (4–0). 160: Trent Helms (F) def. Chandler Workman (MP) (6–0). 170: Maguire Fitzgerald (F) def. Mason Hughes (MP) (7–3). 182: Will Ahnen (F) def. Kyle Vondra (MP) (Fall 6:36). 195: Logan Klaas (F) maj. dec. Daniel Nordstorm (MP) (18–6). 220: Brayden Leffler (F) def. Mason Horn (MP) (Fall 1:38). 285: Devon Kohrs (F) def. Garrett Ward (MP) (Fall 3:36).